One of the highlights of any holiday meal – even one that is inspired by the wildness of the great outdoors – is dessert. For some, that dessert is a pecan pie. For others, it is pumpkin pie, straight from a Bing Crosby holiday tune. And for still others, we're talking cherry pie, perhaps with a scoop of whipped cream or vanilla ice cream added in for good measure. 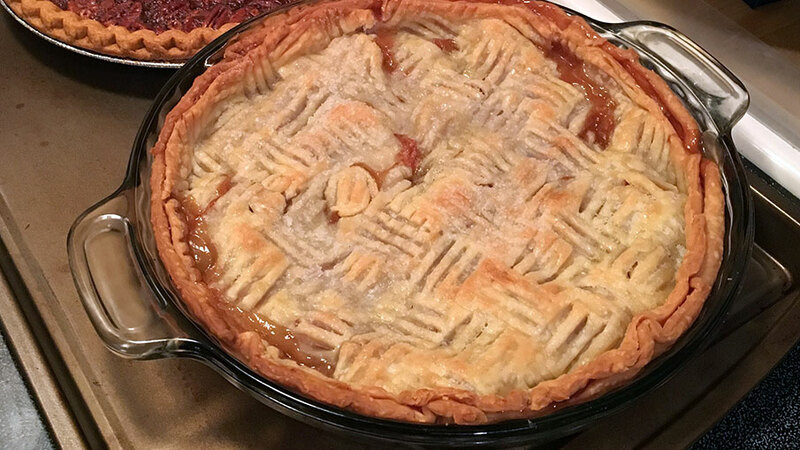 But for Angie Denny of Table Mountain Outfitters and the Sportsman Channel show THE LIFE at Table Mountain, nothing says holiday dessert like an apple pie with a flaky crust. Especially one that has been prepared using rendered fat from a spring bear harvest. To make this apple pie recipe, Denny says that you'll first want to prepare the crust. Then you’ll prepare the filling and bake until golden brown and bubbling. "This is a really flaky crust, so it will crumble on you (after it's baked)," said Denny. Editor's Note: Prepare some extra pie crust dough if you want to put a fancy lattice work on top of your apple pie. "You mix it (ingredients) all together, adding a couple of tablespoons of water if it doesn't come together," said Denny. "Then you chill it for 15 minutes." Next, Denny says to roll the mixture up into a pie crust. After the pie crust is prepared, you'll want to use your favorite apple pie recipe. Incidentally, in Denny's mind, that involves the use of Honeycrisp apples, something that her husband Scott gave an enthusiastic head nod to. To that, I'll add in one of my wife's favorite apple pie recipes, one that she discovered at our church a number of years ago. When her crust lattice work is added in, it’s sweet goodness at its very best! After assembling the ingredients, combine them all together. Pour into the pie crust mentioned above, forking the edges, adding the doughy lattice work, then spreading a small amount of butter on top, and sprinkling with sugar. After that, it's time to put this Apple Pie with Bear Fat Crust Recipe into the oven. "You bake it 15 minutes at 425 degrees," said Denny. "Then you reduce the oven heat to 375 for 30 to 40 minutes." With a note that baking times can vary based on things like your particular oven, the altitude you live at, and other such possibilities, you'll want to pull the apple pie from the oven when it is golden brown and bubbling good. All that's left to do then is to serve Apple Pie à la Bear to your guests and sit back to collect the compliments about a homerun kind of holiday dessert. Thanks in part to an assist from a bear hunt last spring.